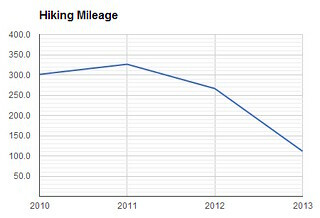 In 2013 my hiking mileage of 111.4 miles had plummeted 58% from what it had been 2012, and was down 65% from my peak mileage of 326.3 miles in 2011. I have almost exhausted the supply of new trails within a reasonable range without an overnight stay, and 2013 was when Wendy became a big part of my life. While she likes to hike, we enjoy many other sorts of outings as well. I started 2014 with a bad cold, but as soon as it let up, Wendy got me back out on the trails, helped along by some warm weather days. Limiting our travel time, we stuck with the closest trails to home. On January 11 we drove west 20 miles to hike three miles on the blue bike trail at Osage Hills, where I confirmed that the Osage Trail from Camp McClintock has indeed been rerouted onto a parallel track in one spot, swapping designations with the old bike trail route. 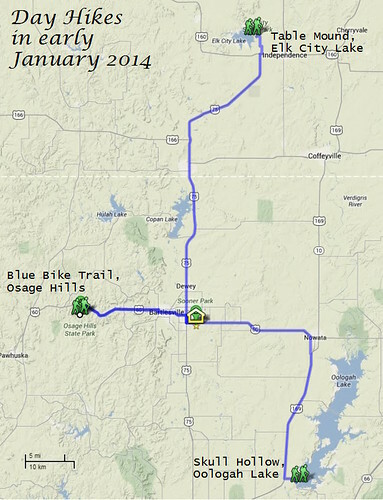 After I confirm the precise change, I’ll update my online map of the trails of Osage Hills State Park. On January 12 we drove north 45 miles to hike 1.5 miles north and then back again for a three mile walk, starting from the south end of the Table Mound Trail at Elk City Lake. The weather was warm, but the wind was really up, whipping west across the plates of ice on the lake and blasting at us up on the bluff at one of the westward lookouts. A large flock of birds out on the ice were hollering continuously, and I enjoyed taking close-ups of the ice forms out on the lake. Thankfully the trees sheltered us from the wind, and when we turned east to walk along the north side of a peninsula, the mound itself provided shelter. Looking north toward the dam, we spotted a couple of places where the ice had buckled upward. Along the shore, wave interference had created a series of snow mounds. On January 19 we drove 37 miles southeast to hike the Skull Hollow Nature Trail at the Hawthorn Bluff Campground on Oologah Lake. I knew the part of the campground with the trailhead would be closed, but we were able to pay a day use fee at the box and park near the gate to that portion of the campground and walk a quarter mile to the trailhead. We followed the main trail’s outer loop, ignoring the two smaller inner loops, and then extended our walk to 2.1 miles with a trail to a park gazebo. After pausing at the lake overlook, where a cold south wind blew right into our faces, we crossed a footbridge to begin walking the perimeter of the hillside, walking through the trees near but above the lake shore. Wendy hears better than I do, and knew a Cardinal was around. I finally spotted him and he posed for a photo shoot. 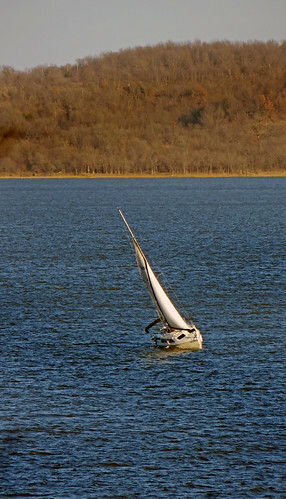 I kept pausing along our route to snap sailboats on the water, watching them heeling over and tacking. 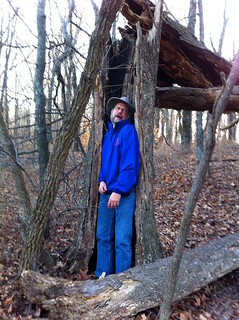 Wendy and I both posed for shots, her along the trail and me as I struggled to squeeze into a hollow tree in a vain attempt to prove I could fit into it. My shoulders were too broad and my dignity suffered. Back at the trailhead, I noticed that the cow skull carving on the sign is rotting away. Across the road was a “Gazebo Trail” which I tried to take years ago, but couldn’t penetrate because of the huge number of spiderwebs. This winter it was a clear and pleasant walk over to the other campground area’s gazebo amphitheater.